by Geoffrey Ciani – After being awarded a majority decision victory against the ageless warrior Bernard Hopkins, in a fight that appeared more decisive than the rendered verdict might suggest, ‘Bad’ Chad Dawson issued a direct challenge to super middleweight champion Andre Ward. Dawson made his intentions abundantly clear that this was the fight he wanted, even insisting that he would venture south to 168 in order to make it happen. Ward ultimately accepted this challenge, and now the two are slated to square off in a highly anticipated showdown on September 8. Even though Dawson claims he can comfortably make weight and perform effectively as a super middleweight, many observers simply do not believe him. As a result, while the reality may be that this is nothing more than a tremendous clash of talent, the perception is that Dawson is being compromised. Not only does Chad, a naturally big light heavyweight, need to shed an extra seven pounds to make the 168 pound limit he last made over six years ago, but he will also need to travel to Ward’s backyard in Oakland. In the eyes of many, even if Ward wins in the most impressive fashion imaginable, the victory will already be tainted because of the concessions “forced on” Dawson. In fairness to Ward, he did not do anything wrong here. A challenge was issued, and he accepted. That is all there was to it. Case closed! After all, if Dawson did not feel he could compete at an elite level against world class opposition in the super middleweight division, then why issue the challenge at all? That is the reality. Unfortunately for Ward, however, in boxing perception is oftentimes more important than reality. As such, he has placed himself in a very unfortunate predicament where, despite his best efforts, there will forever be question marks surrounding this bout in the event of a Ward victory. This of course all assumes that Ward can defeat Dawson, which is no guarantee at all. Lest we forget, Dawson is one of the most talented and athletically gifted fighters in all of boxing. He is coming off a win against a seasoned veteran who, despite his advanced age, is still among the craftiest and most intelligent in the game. In fact stylistically, Hopkins probably served as fantastic preparation for Dawson going into the Ward fight. 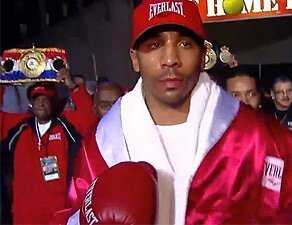 Ward is like a younger version of an older Bernard Hopkins, possessing the ring smarts and shrewdness of B-Hops, with the addition of youthfulness and superior reflexes on his side. Chad could very well wind up being just as effective against Ward, if not more so, than he was against Hopkins. The game changer that sealed this as “lose-lose situation” for Ward came when Carl ‘The Cobra’ Froch bludgeoned Lucian Bute over in Nottingham. If Bute had emerged victorious, as the odd-makers and majority of fans had anticipated, Ward would have had a much stronger case for making Chad come down. Bute would have represented unfinished business for Ward at 168, and thusly served as a valid justification for making the Dawson fight at super middle. Since Bute lost, however, there really is no one left for Ward name-wise at 168. He already cleaned out the division in spectacular fashion by winning the Super Six Boxing Classic and collecting two championship belts along the way. If Ward had wanted to make this a “win-win situation”, all he needed to do was insist that the Dawson fight happens at 175! The ideal time for Ward to make this move would have been immediately after Froch scored the upset against Bute. Fans would have inherently been less critical of Ward, because they would have seen that he was willing to compromise, too. To be sure, his harshest critics would no doubt have still complained about the fight being in Oakland, but on the flipside there would also be more fans who admired Ward’s eagerness to participate in the give-and-take spirit of negotiation. At the end of the day I do not think the 168 pound weight limit will play a huge role in the outcome of the fight. Likewise I do not feel it would make much difference if it was happening at 175, either. I believe the better man will win, plain and simple. We are dealing with two exceptionally talented athletes, both at the peak of their abilities, who are going to most likely put on a fine display of textbook skills, tremendous athletics, and refined raw talent. Indeed the winner will be determined by who executes better on fight night, regardless of what the scales say both officially and unofficially. May the best man win! Next boxing news: Can Magomed Abdusalamov Take Out “Big Time” Jameel McCline?